Coffin Creepers Lollipops Halloween suckers. 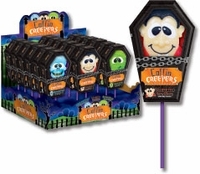 These cute coffin creeper lollipops are not creepy at all. There are 3 different styles of Halloween Suckers. You will get either a skeleton sucker, vampire sucker or mummy. The flavors are blue raspberry, cherry and green apple all in a cardboard coffin. Kids will love getting a scary shaped sucker each coming in a cardboard coffin. Due to availability we will pick which style we send.